Exceptional settings inspire innovative and evocative architecture, as in the case of architect John Mainwaring's striking set of multi-storeyed over generous-sized villas which appear to float in the trees, yet are designed to capture the most extraordinary uninterrupted, sweeping, north-easterly views of Sunshine Beach and the Coral Sea, from every level. It's impossible not to be impressed at the front entrance, followed by the vast living areas and beyond. There's a nod to the Mediterranean with banks of sliders and glass louvres, marble bathroom tops also terracotta and mosaic tiles, while curvaceous lines throughout suggest art deco. There's a seamless connection to the oh-so-wide balcony - a showstopper, aided of course by mesmerising views from the headland of the Noosa National Park across the Coral Sea to Mooloolaba. Between the dining and the kitchen spaces is built-in bespoke cabinetry in the shape of a grand piano. It is the ultimate accessory for entertaining and an adjunct for the kitchen which has Corian bench tops, timber cabinetry, a gas stove top and a balcony. The huge master suite, more a retreat, is on level two. It has a walk-in robe, large ensuite with walk-in shower, a bath and once again sliders 'disappear' to reveal a wide balcony. It's common to see humpback whales in season and be eye-level to hang gliders. Waking to unbelievable sunrises and the sound of the surf is a daily occurrence. A queen-size bedroom on the western side has an ensuite and balcony. The piece de resistance (yes, there are many) is the roof top. Not one but two terraces. One for sun-worshippers and Jacuzzi lovers and because the other has a bar/kitchenette, it's for sundowner aficionados, or just quiet time listening to the birds singing their own praises. And there's more. On the lower level with a dedicated front entrance or access via a staircase from level one is guest accommodation. There are two bedrooms, a bathroom, laundry and a private balcony. 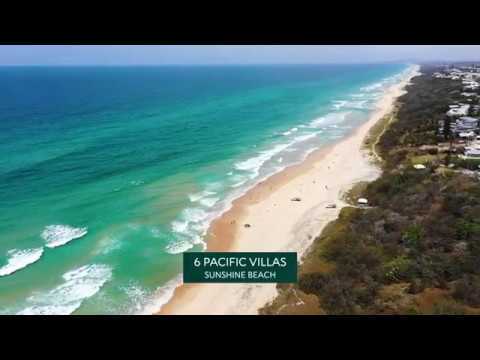 "Enjoy the best of everything Sunshine Beach has to offer," enthuses Tom Offermann Real Estate agent Eric Seetoo. "It's aluxe abode with stunning sea, sand and coastal views, sun-drenched balconies and two rooftop terraces, in a breathtaking location just 100m to the sand or 50m to popular cafes, bars and boutiques. What more could you ask for?"